Prairie du Chien City Hall is located at 214 East Blackhawk Avenue, Prairie du Chien, WI 53821; phone: 608-326-6406. Photo: W.H.C. Folsom House, ca. 1842, 109 Blackhawk Avenue, Prairie du Chien, WI. Listed on the National Register of Historic Places in 1984. Photographed by User:Jeff the quiet (own work), 2012, [cc0-by-1.0 (creativecommons.org/publicdomain/zero/1.0/deed.en], via Wikimedia Commons, accessed January, 2014. Prairie du Chien, the second oldest settlement in Wisconsin, lies on a broad terrace overlooking the Mississippi, three miles north of the confluence of the Mississippi and Wisconsin Rivers. Since 1880 its importance as a trade and transportation point has gradually diminished; today the city is a sleepy and spacious settlement looking to recent improvements on the Mississippi for new energy and new purpose. The Mississippi flows sluggishly here, its course diverted by innumerable islands; the oldest section of the city is built on one of these islands, St. Friol, connected by bridges with the city's other sections, which stretch back from the river towards the bluffs. Soon after the journey of Joliet and Marquette down the Wisconsin to the Mississippi in June, 1673, the site of Prairie du Chien became an important gathering place for Indians and fur traders, and a stopping place for adventurers. It is believed that Nicholas Perot erected Fort St. Nicholas at or very near the site of Prairie du Chien in 1685. Jonathan Carver, who stopped here in 1776, found a village of several hundred Indian families. Although a land claim made in 1781 by three French Canadians sets that year as the date of the first permanent settlement, it is believed the French stragglers had settled here before 1761 and had named the place for a Fox chief whom the called Le Chien (French, meaning dog). Each spring and through the summer until late fall, flatboats laden with trinkets, food and "firewater" arrived at the village; Indian tribes from the remotest sections of the Mississippi and Wisconsin came with great packs of furs. A market was set up on St. Friol Island and the settlement was alive with tremendous activity. Prosperous traders, boisterous coureurs de bois and voyagers swaggered about in buckskins, bright caps and scarves, with ornaments dangling from their ears and bracelets on their arms. Habitants, those white farmers, boatmen and mechanics who lived at the village, gathered at the market place to buy calico shirts, scarves, caps and deerskin culottes from the traders. Resident traders and military officers appeared in silk and velvet costumes or in uniform. Mingling with these frontiersmen were half-naked Indians, their bodies painted, their long hair bedecked with feathers. As winter approached, the traders went back to Mackinax or New Orleans, the Indians returned to their villages, and Prairie du Chien became once more a lonely frontier outpost. The American Fur Company Post (Bolvin and First Streets) is a two-and-one-half-story stone structure built in 1835 by Joseph Rolette. In 1842 Rolette rented this building to the American Fur Company which had been organized by John Jacob Aster in 1808. Astor's company first started operations in Prairie du Chien in 1817. This building, now a private residence and store, served mostly as a storage place for furs. The Brisbois House, 344 North First Street, was built in 1815 by Michel Brisbois, who came to Prairie du Chien in 1781 and became a trader for the American Fur Company. The house, one of the oldest stone buildings in Wisconsin, has a five bay front, a small pedimented portico supported on corner posts, and a lean-to clapboard wing. Hercules L. Dousman, the most influential of Astor's agents here, amassed a fortune from his fur-trading activities. 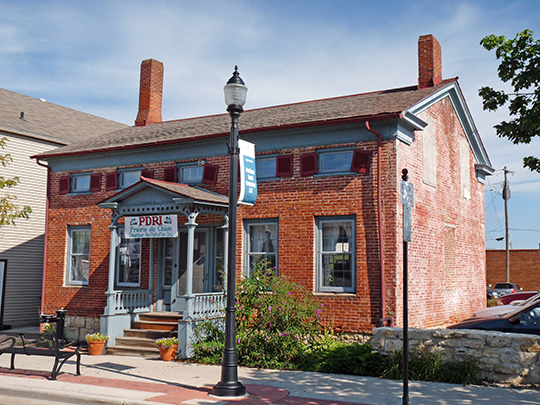 The Dousman Hotel, Fisher and First Streets, is a large stone building, built in 1863 by the railroad to assure accommodations for its patrons. Deserted for years, it has recently been repaired and is now used as a meat-packing plant. Villa Louis is the mansion built by Dousman in 1843 and remodeled by his son in 1872. Although the present structure has been altered and is now a long rectangular building with twin end chimneys and a glass-enclosed veranda, it has been refurbished with the dishes, ornaments, paintings and furniture brought here by Dousman and his wife, and with carpets and wallpaper in the style of the original. Villa Louis and the 80-acre park were presented to the city in 1935 by the Dousman heirs.